Creationism | Why Dont You Blog? I only registered the existence of a new UK ID promotion centre after a comment here from Grumpy Bob led me to his blog. I must start paying attention. Just when you think that the ID nonsense is dead, it pops up again, Whack-a-mole style. Here’s the Guardian version of the story. There are huge numbers of comments on the Guardian piece, most of which make excellent points. Yet again. The small print of the website says the centre’s activity “is organised under a charitable trust governed by the laws of Guernsey, Channel Islands. Well, we wouldn’t know about that, would we? What with the trust being set up in the Channel Islands? Well, so it says in the Guardian special on the rise of creationism. They also claim that the aggression of the new atheists is helping them. They paint Dawkins as a “recruiting sergeant” for creationism because he links evolutionary thinking with atheism. “He has been a real help to the ministry, ” says Randall Hardy. Indeed, even the article undercuts the implications that there are grounds for this “Blame atheists for creationism” viewpoint. Almost all Christians used to go along with the idea that Genesis was a bit suspect on dates, and that the six days of the Bible were metaphorical, with each day representing a vast geological age. The majority of Anglicans, theistic evolutionists who have no difficulty in believing in a Darwinian God, would still abide by that. But the publication in 1961 of Henry Morris and John Whitcomb’s The Genesis Flood, which set out to give a scientific demonstration of the literal truth of the Bible, emboldened those who refused to accept evolution. 1961? Dawkins was 20 then. I’m pretty certain this predates The God Delusion by a few decades. Well, Wikipedia informs me that the God Delusion was published in 2006. What on earth was fuelling creationism in the intervening decades, then, if noisy atheists are to blame now? Or are we to start dating the “New Atheism” in creationist terms, so that we are to accept not only that dinosaurs walked with men but that an undergraduate Dawkins managed to spark the rise in creationism with his strident atheist complaints? This article does provide creationist “answers” to two questions that have long baffled me. Question: Why didn’t Noah take all the dinosaurs into the ark if humans and dinoasurs were all happily living together? Creationists, who argue that the world was created no more than 10,000 years ago, believe dinosaurs and man co-existed in the pre-Flood period (they date the Flood to around 1,600 years after the creation), that there were dinosaurs on the ark, but that they were eventually wiped out by the changes in climate which followed the Flood. What have creationists got against the biological sciences that they don’t have against mathematics or physics or geography? It seems that biology is nothing special. They are indeed just as willing to abandon all sciences where they conflict with the Bible. The Guardian writer either assumes that almost any reader will see the creationists as self-evident nutters or he lacks the most basic information-processing skills. For example, he uncritically reports “findings” from all those surveys (e.g for Theos :-)) that supposedly show that sizeable minorities of the population are creationists. British creationism is surprisingly independent from the far bigger, better funded, more vocal, highly politicised movement in the US, where creationists and intelligent design organisations (often a front for Christian creationists) are fighting perpetual legal battles to get creationist teaching into the classrooms of state schools. The Portsmouth Genesis Expo may be a saggy old cloth cat to the Cincinnati Creation Museum’s roaring lion. This doesn’t mean that they aren’t manifestations of the same species, seen once in tragedy (Creation Museum) ; the second time in farce (Genesis Expo). If I had to choose between whether to blame “The New Atheism” or the media (who present the opinions of lunatics as if they have some validity, in a “two sides to every argument” distortion of the concept of balance) for the rise of creationist lunacy, I know where I’d lay most of the blame. Always willing to flog a dead horse, I’ve stumbled across more mind-bending nonsense on the crazy-fest that is Yahoo! Answers. As I mentioned previously, this (*) is a haven for the weird and wonderful ideas people can come up with. Sadly, in the best of Web 2.0 traditions, idiocy, bad education and lies rise to the surface while real education gets drowned under the stupidity of the commons. I honestly think that if a good answer ever turned up it would be drowned under the idiocy (and get so many thumbs down) it would quickly flee for its life. At first site this looks like a legitimate question. It is the sort of question you would expect inquisitive school children to ask. It gives the chance for a well thought out answer about the nature of fossils, what evolutionary theory is and how scientific proofs work. You can imagine it being the sort of question a teacher would set a class to see what research they carry out. Well, Toutatis forbid they type the question into a search engine. The results are shocking. To an otherwise ignorant person seeing to improve their education, this search would be disastrous. Anyway, back to the question. The fact that dinosaurs once lived and are now extinct is no proof of evolution. Such fossils merely show us that certain species once living were destroyed and became extinct. Theorists have been able to reach no general agreement on the cause or causes of extinction. The theories on this subject are numerous and sometimes very imaginative. Since most fossils are found in sedimentary rocks and show signs of catastrophic burial, they seem to point to a global flood as the principal cause of extinction. They must have lived on earth at the same time, just as the Bible implies. If the flood-geology interpretation of geological strata is correct, all or most dinosaurs became extinct at the time of the flood. Until that time, then, man and dinosaurs lived on the earth at the same time. Its good that he uses an “if” to start there. I agree that if the flood geology interpretation were correct dinosaurs died at the flood. However it isn’t. It isn’t even close. Man and Dino did not live on Earth at the same time. It really is that easy. Is there any EVIDENCE outside of the Bible to support this view? Yes, there is. It is well known that along the Paluxy River in Texas many dinosaur footprints have been found in limestone strata classified as Cretaceous. Not so well known is the fact that for about fifty years human footprints have been reported in the same strata. But since the concept that man lived with dinosaurs is incompatible with the theory of evolution, many Scientists dismiss this documentary for the persuasive evidence unfolded. The wonders of the internet (and specifically web 2.0) push this stupidity to the top of a search engine query. The miracle of Web2.0 gives the asker the chance to give prominence to the madness that the person asking the question wants to be seen as the answer. Yes, if you scroll down you can find better answers but not everyone is going to do that and, crucially, when they have had their reasoning tainted by the initial two bits, they will be more sceptical of the truth than of the idiocy. Web 2.0 is not about empowerment and it certainly is not about the shared wisdom of the masses. The tragedy of the commons seems so much more appropriate. This is pretty much what the Teachers TV poll suggested in November. Maybe it’s the same poll and the Guardian’s confusing breaking news with news that Randerson already wrote about months ago. I can only hope so. Steve Jones and Dawkins responded, using phrases like “very depressing” and ” a national disgrace.” Quite. Almost a third of teachers think creationism should be taught on a par with evolution, according to the Times. Of the 1,200 questioned, 53 per cent thought that creationism should not be taught in science lessons, while 29 per cent thought it should. OK, a third is some serious rounding up from 29%, but the 29% figure itself is quite scary. It suggests that 29% of teachers are either stupid or batshit crazy, which isn’t encouraging. After all, these people have made their way through years of school and higher education to get to become teachers. It’s certainly evidence for how far ID /creationism has penetrated the UK. As you might expect from the name, Teachers TV is mainly worthy but dull (Key stage x in subject blah) but it sometimes has some fascinating content. (I’ve accidentally caught programmes on neuroscience and Turkish tiled architecture, when randomly clicking through the cable channels.) They are currently featuring “Evolution week” on their site. So these poll results don’t seem to be skewed in favour of a creationist agenda. Dr Rutherford says that science teachers with those views need retraining or should be taken out of the classroom if they refuse to change their opinion. That seems as uncontroversial as saying that a domestic science teacher who can’t boil an egg should be retrained or sacked. the idea that unintelligent design (naturalism) can be falsified while at the same time intelligent design cannot is logically untenability [sic] and morally dubious. If a design did not come from an unintelligent source there is only one conclusion left. Excluding special creation from discussion leaves evolution as the only option this is hollow victory. More and more the public are seeing it as such. Professor McIntosh may talk about birds but he is an engineer, not a biologist. Nor is he a geologist, as can be seen from his claim that the Grand Canyon was formed by Noah’s flood – “probably in matter of hours”. He isn’t a historian or a linguist either, despite having produced a DVD claiming that the Chinese ideographic script provides evidence of the Tower of Babel. What he is – and he proclaims this proudly – is a committed Christian who believes that the biblical account of creation in Genesis is to be taken literally and that it happened about 6000 years ago. Everything he and his fellow creationists claim stems from that one premise and nothing else. 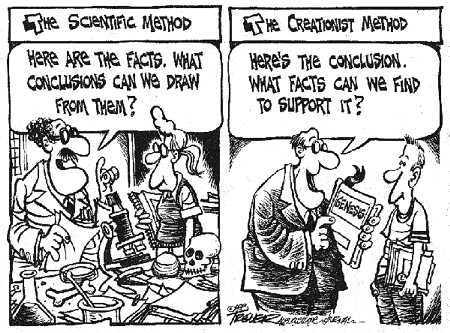 The issue is not whether Creation should be taught in science lessons. The issue is how genuine scientific thought and debate should be encouraged. Stifling the debate as Adam Rutherford suggests is a recipe for tyranny and there is a great danger of insisting that atheism is the only paradigm in which to conduct science (patently not true when one considers the greats like Faraday and Boyle of earlier centuries). It is even more disturbing that teachers don’t seem to have a basic grasp of logic than that they think it’s reasonable to teach creationism in science classes. This “stifling the debate” is a common but deeply flawed creationist argument. There are a million to the power of a million possible theories about the nature of life. Indeed you could produce alternative theories about anything. I could try to get a cup of coffee by standing on one leg, putting a cat on my head, facing magnetic north and chanting “Ding McChing.” It probably wouldn’t work but who knows if they haven’t tried it? If I was undergoing barista training for a chain of coffee bars, I wouldn’t expect them to allow that as an alternative to switching on the machines, grinding the beans and so on. Or if there was really relativist manager who’d let the trainee baristas discuss their own theories, wouldn’t they have to try out the sacrifice of a young goat with a silver knife, if someone else liked that idea? of course, you might have to wait a few millenia for a double espresso. I can’t see the difference here at all. Some theories have been proven to work through experiment. Until there are theories that work better, it would be slack not to teach people the ones with the empirical backup. I think Terry Pratchett has at least one (science?) degree. In his Diskworld books, a flat earth is carried on the backs of giant elephants standing on the back of a turtle. What if some of his readers don’t understand the concept of “fiction”? (Not unlike the average fundy) Surely this theory should be discussed in science classes? Respectfully, as a legitimate alternative to geography, in case any of the students’ parents believe it, of course. Creationism and intelligent design should be taught in school science lessons, according to a leading expert in science education. Reiss’s argument is that teaching real science puts off the supposed 1 in 10 kids from religious homes who have been taught creationism. I don’t even believe the spurious “one in ten” homes bit, but let’s accept it as true. In that case, how urgently do schools need to teach real science? It would be an educational emergency. The reasonable response to such a horrific statistic would be to expand science teaching and do it right. Not to give up the unequal struggle to challenge ignorance. Why stop at science if you accept the principle that “school subjects that conflict with idiots’ values should be changed to fit those values”? English lessons can be tough for kids who haven’t got any books at home. Why not just let them uncritically watch daytime TV shows, instead? No, that wouldn’t happen, because there are no vocal US-funded “pro-soap” groups demanding daytime TV instead of literature and claiming the spurious authority of “faith.” Unlike the case with evolutionary biology. This Reiss guy is in the wrong job. He’s the Royal Society’s director of education and he doesn’t even grasp the role of the Royal Society or understand what science education is. If science lessons are to become a free-for-all, there are plenty of more engaging alternatives apart from the “magic man did it” claim in one particular old book. What about teaching numerology in the mathematics class? And how does physics get off so lightly when faith comes into the lab? The physics of angelic visitations has been heinously overlooked. Blimey, my school geography teacher never even bothered teaching us the controversy between dull soulless-sciencey people who think the earth is a sphere and the view common at Unseen University that the world is a disk carried through space on the back of a turtle and giant elephants. The holy books of the Diskworld canon probably outsell the Bible. (They certainly get read more, with more attention.) So, how come this debate isn’t taught in science lessons?